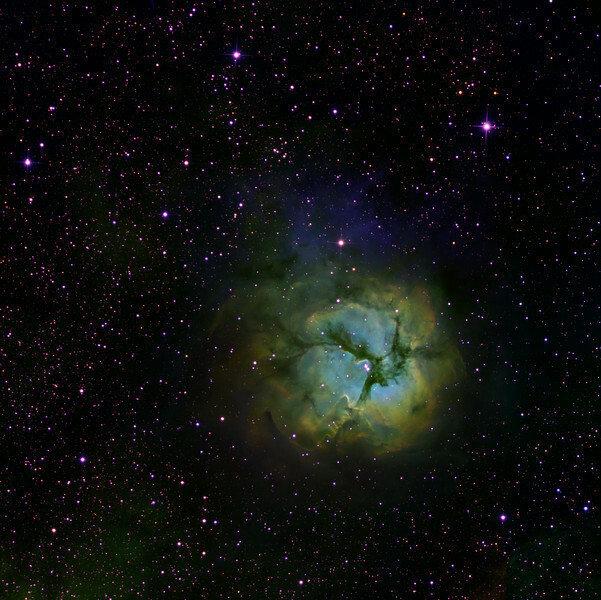 Trifid Nebula (M20) in Sagittarius. H-alpha (G), OIII (B), SII (R) 5 hrs each. Combination of Aspen 16M and SBIG STL11000M on 20" PlaneWave CDK. Toward the bottom of the central brght region is a superb Herbig-Haro jet, looking like a narrow vertiacal thorn. (best seen at 1:1 zoom).. Although there is strong OIII emission in the main part of the Trifid, the intense saturated blue above it is mostly reflection nebulosity sneaking through the 3nM filter.